This sweet boy is decked out in his holiday best to join the winter fun. 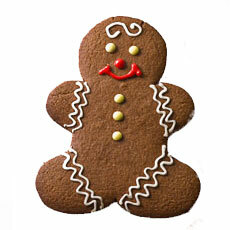 Our Gingerbread boy is a traditional favorite of the season. Soft and chewy with a bite of spice to warm you up on those cold wintery days. Seasonal - Available November through January.